50g long life industrial superglue, Supplied in a long nozzle non clog bottle with a shelf life of upto 7 years! Ultra thin super fast cyano cyanoacrylate adhesive for industrial , home ,automotive, hobby or diy use. 50g cyanoacrylate glue in a non clog nozzle bottle, this cyano adhesive is formulated to give a shelf life 7 years unlike other cyano glues. Bonds to alomost any surface such as all metals, porcelain, wood, china, stone, bone, ceramics, glass, rubber, leather, most plastics. Ideal for all DIY work, caravan repairs to panels, model kit building , craft work, car boat train plane repairs to trim, panels and other items , kitchen cabinet repairs, wooden plastic and metal models, bonds all your rubber trims on anything, firmly bonds to grp, carbon and polyester plus most other mouldings, idela for ceramics, bone, leather..will not crack and flake. 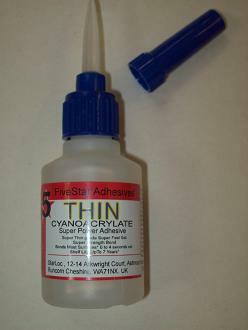 Suitable for almost anything!,this cyano is the ultimate wonder glue.